Last weekend, my Husband and I traveled to Philadelphia, Pennsylvania for one of my old High School friends weddings. 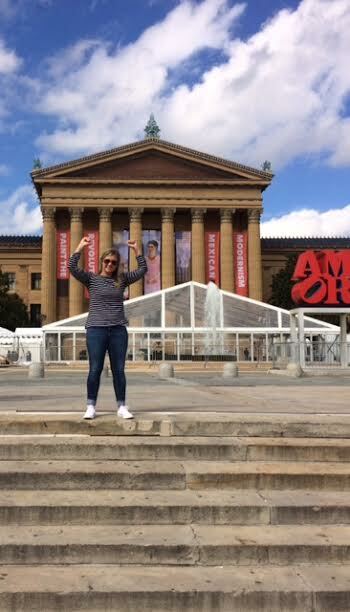 We were only there for the weekend and I have never been to Philadelphia, so I wanted to squeeze in as much as possible. I'm not kidding when I say we walked over 15,000 steps exploring the historic city. 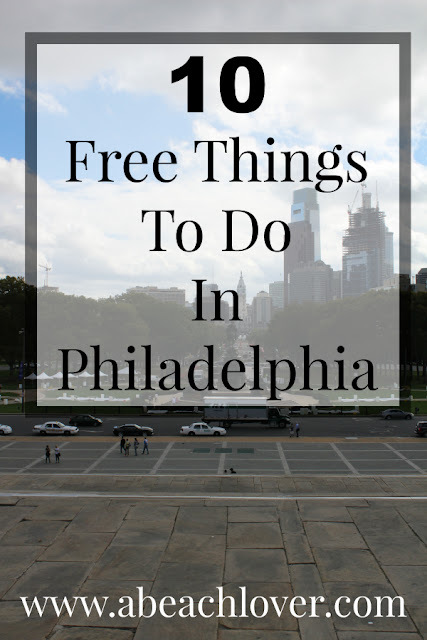 There is a lot more to Philadelphia than just Cheesesteaks, so without further adieu, here are 10 FREE things you can do in Philadelphia! 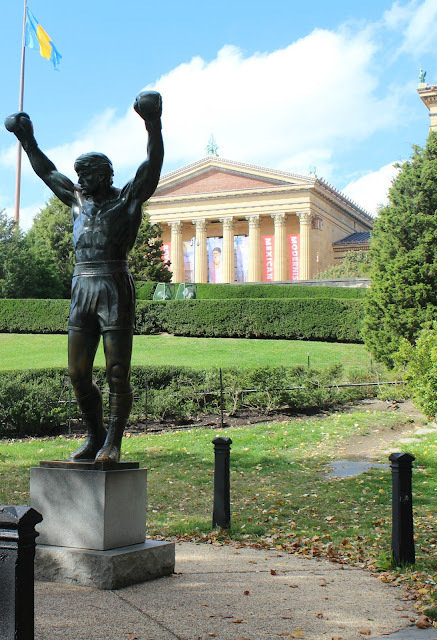 The Liberty Bell has been around since 1750 and has grown to be one of America's most symbolic pieces. No one knows when the crack on the bell actually happened, but in the 1800's workers tried to repair the crack and actually made it worse. 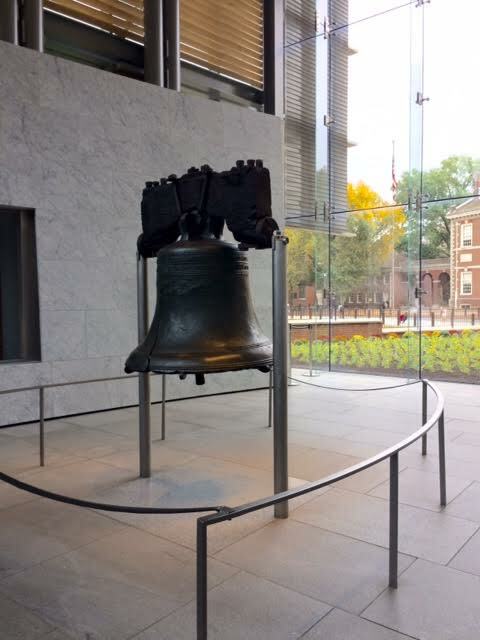 The Bell used to be hung atop Independence Hall, but it now sits inside Liberty Bell Center. I would highly recommend getting to Liberty Bell Center first thing in the morning to avoid crowds. We went at about 10 AM and didn't have to wait in line and there were not too many people there yet. I guess the line can get pretty long, so plan accordingly. Tickets are not required and its 100% free! Located across the street from The Liberty Bell is Independence Hall. At Independence Hall, you can see where the Declaration of Independence was signed and where the US Constitution was adopted. Tickets are free and they conduct tours on the 20 of every hour. You will definitely learn some interesting facts. Did you know that George Washington received 100% of the Electoral College votes!? Me either! 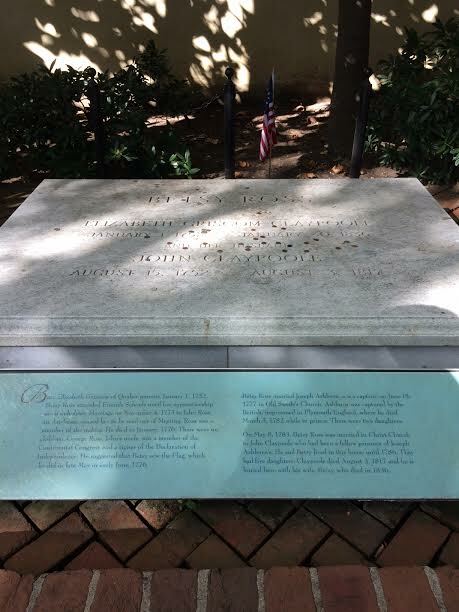 About a 10 minute walk away from Independence Hall is Betsy Ross' house and burial ground. 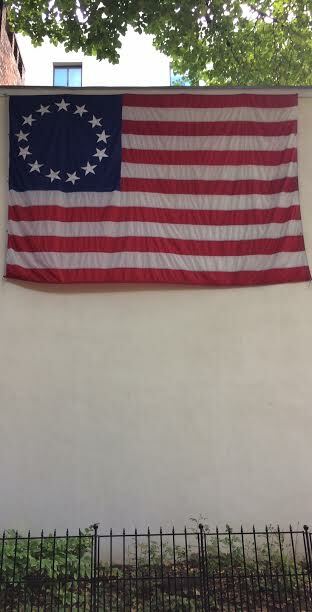 Betsy Ross sewed and created the first American Flag ever. You can see her house and burial ground for free, but if you want to pay an additional $5 you can go inside and see the actual house. We opted to just pass by and poked around in the gift shop. 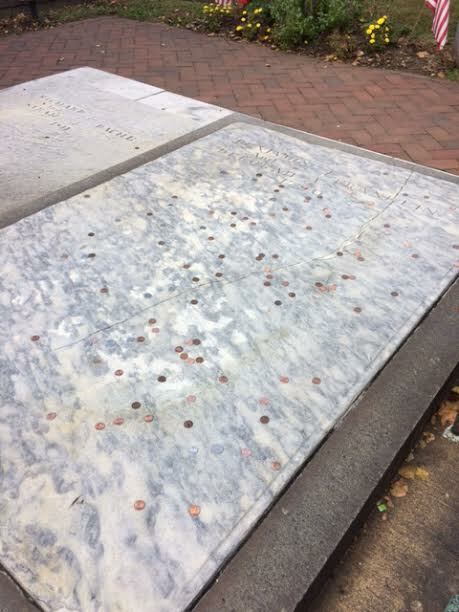 Benjamin Franklin's grave is about a 5 minute walk from Betsy Ross' house. If you pay $1 to get inside the gated graveyard you can get up close or if you just look through the bars like we did you can see his stone and even throw a penny! JFK Plaza is currently being renovated, but if you want to see the infamous LOVE sculpture you can visit it temporarily near City Hall at Dilworth Park. Spoiler Alert: The LOVE sculpture is A LOT smaller than you think. 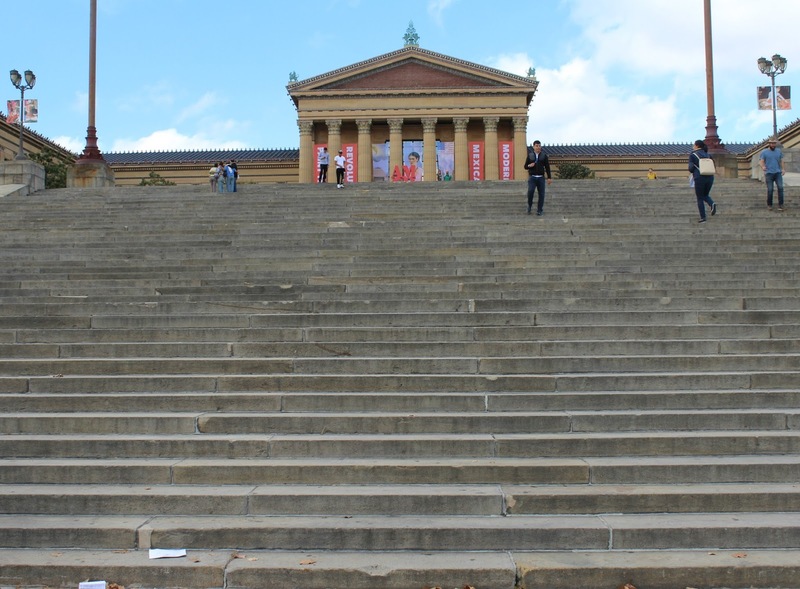 We all know the famous Rocky movie, where Rocky Balboa actually runs up a large set of stairs outside. You can visit these stairs and see the Rocky statue all in one visit right outside the Philadelphia Art Museum. Disclosure: You will see lots of tourists running up the stairs and then awkwardly pumping their fists in the air at the top (including myself). Bonus: At the top of the Rocky stairs you can see the AMOR sculpture. Behind the Philadelphia Art Museum there is a pretty cool park overlooking a river. 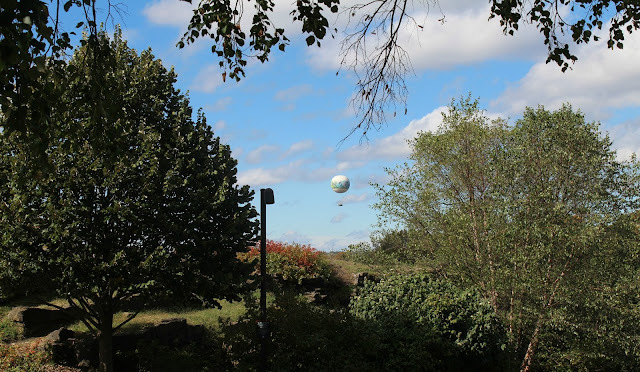 We just happened to see a Hot Air Balloon too! I'm spoiled living near the ocean, so I didn't think this was as cool and picturesque as some might. The City Hall is absolutely gorgeous and I highly recommend stopping by to check it out. You can actually pay $6 to go to an observatory deck M-F to view the city (I wish we had known about the observatory deck before Saturday)! We could actually see it outside of our hotel window too! 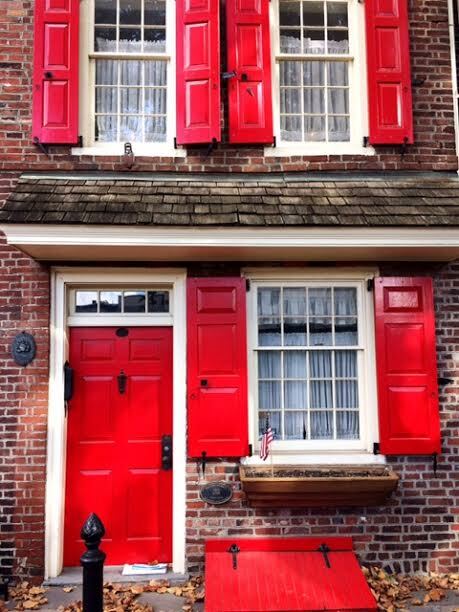 Stroll down the nation's oldest residential street! It's super cute too. A few of the houses on the street are actually for sale and are selling for close to a million dollars. Anyone interested!? Have you been to Philly before!? I would definitely go back and highly recommend it.